Climate change is projected to have severe implications for smallholder agriculture in Africa, with increased temperatures, increased drought and flooding occurrence, and increased rain- fall variability. Given these projections, there is a need to identify effective strategies to help rural communities adapt to climatic risks. Yet, relatively little research has examined the pol- itics and social dynamics around knowledge and sources of information about climate-change adaptation with smallholder farming communities. This paper uses a political ecology approach to historically situate rural people’s experiences with a changing climate. Using the concept of the co-production of knowledge, we examine how Malawian smallholder farm- ers learn, perceive, share and apply knowledge about a changing climate, and what sources they draw on for agroecological methods in this context. As well, we pay particular attention to agricultural knowledge flows within and between households. We ask two main questions: Whose knowledge counts in relation to climate-change adaptation? What are the political, social and environmental implications of these knowledge dynamics? We draw upon a long-term action research project on climate-change adaptation that involved focus groups, interviews, observations, surveys, and participatory agroecology experiments with 425 farmers. Our findings are consistent with other studies, which found that agricultural knowledge sources were shaped by gender and other social inequalities, with women more reliant on informal networks than men. Farmers initially ranked extension services as important sources of knowledge about farming and climate change. After farmers carried out participatory agroecological research, they ranked their own observation and informal farmer networks as more important sources of knowledge. Contradictory ideas about climate-change adapta- tion, linked to various positions of power, gaps of knowledge and social inequalities make it challenging for farmers to know how to act despite observing changes in rainfall. 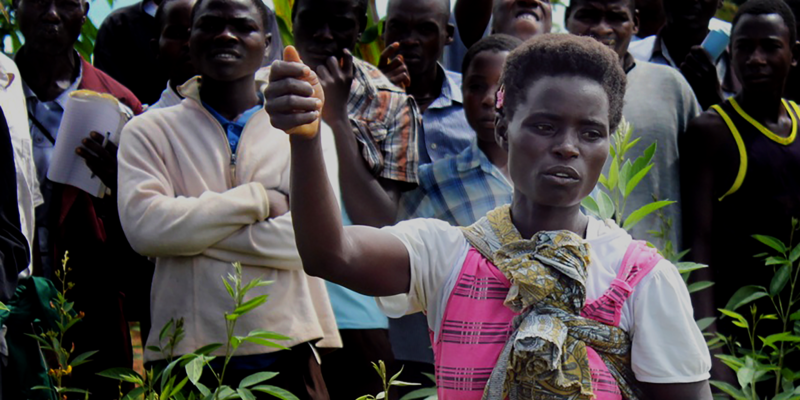 Participatory agroecological approaches influenced adaptation strategies used by smallholder farmers in Malawi, but most still maintained the dominant narrative about climate-change causes, which focused on local deforestation by rural communities. Smallholder farmers in Malawi are responsible for <1% of global greenhouse gas emissions, yet our results show that the farmers often blame their own rural communities for changes in deforestation and rainfall patterns. Researchers need to consider differences knowledge and power between scientists and farmers and the contradictory narratives at work in communities to foster long-term change. Almost every intervention in the field of international agricultural develop- ment — from microcredit finance to fertilizer subsidies to trade policy — has come to recognize gender, and relationships within households, as im- portant. Yet most interventions continue to treat the household as a ‘black box’, with changes within the household measured by the effects on income, anthropometry, health, or other secondary metrics within bargaining models. In this context, there has been increasing interest in time use studies as a way to peer inside this black box. This article offers a review of methods and identifies some of the difficulties facing time use studies in capturing intra- household dynamics, and presents the results of a two-season simultaneous activity time use study in Malawi which aimed to address these difficulties. The results suggest significant limitations to time use surveys. The kinds of reproductive labour that often interest researchers may be invisible to the women responding to time use surveys, with the result that care work is dramatically under-reported. The authors discuss the implications of the divergence between researchers’ concerns and the women’s reports of their lives for time use surveys, and for feminist development research methods more broadly. This paper assesses the relationship between agroecology, food security, and human health. Specifically, we ask if agroecology can lead to improved food security and human health among vulnerable smallholder farmers in semi-humid tropical Africa. The empirical evidence comes from a cross-sectional household survey (n = 1000) in two districts in Malawi, a small country in semi-humid, tropical Africa. The survey consisted of 571 agroecology-adoption and 429 non-agroecology-adoption households. Ordered logistics regression and average treatment effects models were used to determine the effect of agroecology adoption on self-reported health. Our results show that agroecology-adoption households (OR = 1.37, p = 0.05) were more likely to report optimal health status, and the average treatment effect shows that adopters were 12% more likely to be in optimal health. Furthermore, being moderately food insecure (OR = 0.59, p = 0.05) and severely food insecure (OR = 0.89, p = 0.10) were associated with less likelihood of reporting optimal health status. The paper concludes that with the adoption of agroecology in the semi-humid tropics, it is possible for households to diversify their crops and diets, a condition that has strong implications for improved food security, good nutrition and human health. This paper presents the impacts of a participatory agroecological development project on food security and wealth levels. The Malawi Farmer to Farmer Agroecology project (MAFFA) encourages farmer experimentation, community involvement and farmer-to-farmer teaching on agroecology, nutrition and gender equity. Recent international assessments of agriculture have highlighted the urgent need for changes in farming practices in Sub-Saharan Africa, due to land degradation, high levels of food insecurity and anticipated climate change impacts. Agroecological approaches have shown great potential to address these multiple needs. Using a longitudinal panel survey data and propensity score matching to account for selection bias in project participation, we analyzed the impact of the project on household income and food security in Malawi in 2012 (Wave 1 = 1200 households) and in 2014 (Wave 2 = 1000 households). We used the Household Food Insecurity Access Scale (HFIAS) for impact evaluation. Estimates of average treatment-effects using difference in difference methods showed that participating in MAFFA has led to a significant increase in household wealth (β = 3.54, p = 0.01) and a large reduction in food insecurity (β = −3.21, p = 0.01) compared to non-participants, after 2 years, even after accounting for covariates and selection bias. These results indicate that agroecological methods combined with farmer led knowledge exchanges can be welfare enhancing, both in terms of food security and in terms of income for family farm households. Agroecological approaches should be promoted through upscaling of farmer-to-farmer knowledge exchanges, community involvement and attention to nutrition and social equity to enhance farmer learning and household welfare benefits.